The scent of the woody sweetness of lavender blossoms and the aromatherapy of peppermint is something most spa-savvy clients would always look forward to in choosing their spa destination. The busy everyday going and the qualms of the city life, aghhh, your wish for quick escape to serenity is just the same as ours too. You don't need to go far outside the town in search for this haven. A quick trip to your favorite spa can take away all the stress consumed in your busy busy life. 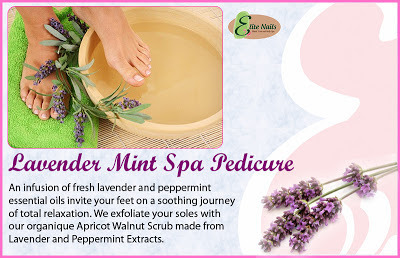 Refresh your foot and legs in a soak infused with fresh lavender and peppermint essential oils. Close your eyes and cherish the moment as the scent of lavender flowers take your senses to the web of nature's love. Next up, experience Elite Nails' TLC as we exfoliate your feet and soles with our organique apricot walnut scrub made from Lavender and Peppermint extracts. This lavender treat's finale is a warm and relaxing massage leading you to a calm state which lavender oils is best known for and a prettifying pedicure to your liking. Spend a day at Elite Nails spa and you’ll surely forget how to even spell stress after having a Lavender Mint Spa Pedicure treat. Have your appointment booked or call these numbers for more info - 09336537276, 09215918801, 09178086950 or at (02) 480-6832. You may also check us out on Facebook and Twitter (@eliteNailsSpa) too.